A few years ago, my husband and I developed a bad habit of eating out at restaurants often. You can read more about that here in How We Found an Extra $1,000 in Our Monthly Budget. We were being foolish with our money, and I was ready to change. The first step towards changing was admitting that we were wasting money on eating out instead of being wise with our money and investing towards our kid’s college or our own retirement. The second step was finding out exactly how much we were wasting on eating out at restaurants. This step was the eye opener. I went through our statements and wrote down every restaurant expense. It was a shocker. We were blowing so much money on restaurants without even realizing it. Then, we added up our grocery expenses and added that to our overall total and it was at that moment that we knew we needed to make changes. My husband and I have been following Dave Ramsey’s baby steps towards a healthier financial life. This book is the book that motivated us to start. We do not carry debt, but just because we had the money to spend, did not mean we could blow it on anything we wanted. We wanted to be good stewards of our money and make sure it was going to the right things — our emergency fund, college, retirement, and giving. We made the commitment to stop eating out and to cut back on it. We didn’t give it up entirely, but we do limit it to only a few times a month. If and when we do eat out at restaurants now, it’s a treat for us because we don’t do it often. Go through your (and your husband’s) previous month’s statements and write down every restaurant expense on a piece of paper. Add the amounts up to come up with your total. This will give you an idea on how much you are spending monthly on restaurants. Do the same for groceries and then add the two together to get your total food expenses. Take some time with your significant other to discuss the total. Too high? It’s time to make some changes! 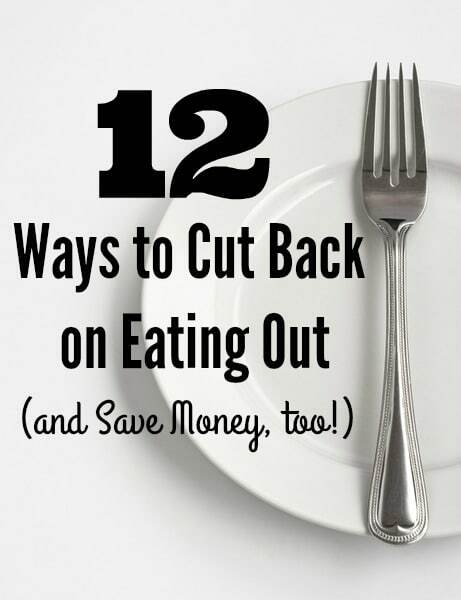 This is time to get creative and come up with a plan to cut back on eating out. 2. Shop from your kitchen. If you were to place all of the food items from your pantry, refrigerator, freezer, and cupboards onto a conveyor belt at the store and let the cashier ring it up, what do you think the total would be? You’ve already purchased the items in your kitchen, now it’s time to eat them up! Each week, I take a piece of paper and divide it into five categories: Breakfast, Lunch, Dinner, Snacks, Drinks. Then, I look through my kitchen to see how many items I have that I can place in each category. I try to come up with different meals to make with what we have and write those down in each category. When I see that our items are running low in each category, that means it’s time to shop for groceries. When there’s no plan for meals, it can be easy to opt for eating out at a restaurant instead. When we weren’t meal planning, we were buying a lot of random items at the grocery store. Many times, we couldn’t even come up with full meals from those items, so we either found ourselves eating out more, or making several trips to the grocery store for food. Now that we meal plan, we only get the items we need from the store to make simple meals for a week or two. Meal planning has been a huge factor in cutting back on eating at restaurants. Once you have a meal plan in place, then it’s time to shop for 1-2 weeks worth of meals. Shop from your list only. It may be tempting to pick up a few items here and there while shopping, but you’ll save money if you stick to the list. It’s a good idea to set a food budget every time you shop. Use coupons to help you save more at the grocery store. 5. Limit eating out at restaurants. If you’ve been used to eating out at restaurants, it can be hard to cut back entirely. You don’t have to give up eating out altogether, but limit it to special occasions or even just once a week. We try to limit it to once per week, if that. When we do eat at a restaurant, we try to go the cheapest route possible to save more money. 6. Get creative if you do eat out at a restaurant. If and when you do eat out at a restaurant, get creative to find how you can cut your bill down even more. Do you have kids that don’t eat everything on their plate? Order one meal and split it up so they can share it. Order water instead. Skip the value meal and order from the $1 menu. It has become a game that whenever we do eat out at a restaurant now, we try to find ways to shave the cost down. 7. Have date nights at home. The night my husband and I discussed cutting back on eating at restaurants was the same night we dropped $75 on our meal during date night. It was our anniversary dinner and we hadn’t discussed saving before then, but I’m glad we don’t spend foolishly like that anymore. For date nights, we decided to skip eating out and spend time at home cooking in our kitchen and on the grill for a delicious homemade dinner. My husband usually grills up a delicious steak and I cook the veggies inside. We love to cook, so for us, this is something we enjoy. You may not enjoy having to cook on a date night – totally understandable! But if you do, this is an option. We also watch a movie after dinner to avoid paying for a movie, drinks and popcorn at a theater. Prepare lunches at home and take them to work! When you have food available to eat, this helps you to avoid the temptation of wanting to go out to get something to eat from a restaurant. 9. Pack snacks and food for the kids. This has been a HUGE money saver for us. I keep a snack box filled up for the car with some juice boxes as well. When I pick my kids up from school, they choose a snack and drink from the box and that keeps them satisfied until I can get home to make dinner. If I know we are going to be out for a long period of time running errands, etc., then I’ll pack lunches for everyone and stop for a picnic or allow them to eat their food in the car. 10. Take advantage of free meals. There will be times when you’ll find activities and things to do where food will be free. Take advantage of these free meal offers! There’s nothing wrong with enjoying free food if it’s being offered. Some restaurants offer free meals for kids. Plan ahead if you must eat at a restaurant and take advantage of the kids eat free feature. 11. Skip the coffee shops. Coffee shop expenses can add up, too. Make your own coffee at home and you’ll save a lot! We used to go to the coffee shop to get doughnuts. Now, we purchase a big box of doughnuts at the store for under $5 and freeze them for those times my girls want to enjoy a doughnut! They haven’t asked to go back to the doughnut shop since switching to buying store-bought doughnuts. 12. Tell your family and friends about your plan. If you are in the habit of going out to eat at restaurants with family or friends, they may not be as motivated as you to save on eating at restaurants. Kindly inform your family and friends of your plan and come up with ways to still enjoy each other’s company without having to spend a lot of money eating out. It may be a hard adjustment at first, but remember, this is YOUR money and you get to decide where your money goes. At the end of each month, total up the amount spent on eating out at restaurants and the amount spent on groceries. Challenge yourself to keep these amounts as low as possible. Set time aside to talk to your significant other on your progress and come up with ways to improve, etc. Cutting out restaurant expenses can be difficult at first, but once you have a good plan in place and see how much money you are saving by not eating out motivates us to keep going! Try this for a month and see how you do! You may become hooked to this plan like we are. The money saved by not eating out will be added to college funds, retirement, and giving to others instead of wasted on restaurant expenses. That sounds like a winning plan to me! Do you have any tips to help cut down on eating out at restaurants? We rarely eat out so this isn’t usually a problem but definitely great ideas for those that do. I find that making sure you have healthy food at home works well. These are great ideas for those looking to fix their financial spending. We don’t eat out very often, but even still the tips for using what is in the kitchen and meal planning are great ideas to help even us save even more even though we don’t eat out very often! We have been eating out a lot and it is getting expensive. I love the tips you have here, the date nights at home would be a real money saver. Eating out really adds up. We have started eating at home and is saves so much!